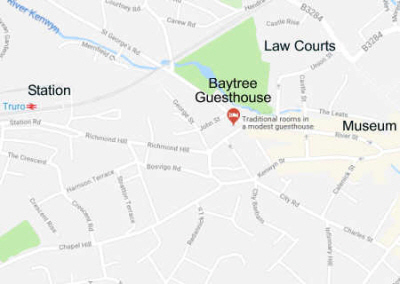 The Baytree is ideal for people staying in Truro on short or long term contracts and a lot of her accommodation is taken by trades people on a nightly basis. Only 5 mins walk from the railway station and 10 mins from the Bus station. 5 mins walk to the Crown and County courts at Edward street. All rooms have H&C water, TVs and superfast broadband. One room has an en-suite shower, and there are 2 more showers 1 upstairs and 1 downstairs with toilets on the 1st floor and ground floors. As guests arrive and leave at differing times rarely is there is a problem with these facilities. Ann has run the Bay Tree since 1990 and over the years has helped many guests and kept them as friends. She is adaptable to help people enjoy their stay. 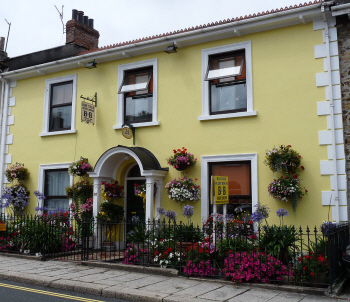 The Baytree is ideally situated for sightseeing and using public transport around Cornwall, e.g. bus and train. Most guests find Penzance - Lands End - St Ives easy to get to, and also to the North Coast towns of Newquay - Wadebridge - Padstow - Tintagel as examples. A ferry boat leaves Truro from early spring and through the summer stopping at Trelissick - St Mawes - Falmouth. The little train leaves every hour to Falmouth. Single occupancy in a single or double room from £35 p.n. low season to £55 p.n. high season. Double or twin for two people from £55 p.n. low season to £65 p.n. high season. 3 persons accommodated in a double room with a pull out bed from £70 p.n. All bedrooms are on the first floor, so may not be suitable for guests with poor mobility. Unfortunately Ann does not take debit or credit cards. Payment on arrival or making a deposit is acceptable. Parking is available on side roads, Ann will advise you on Truro's restrictions. Outside the Bay Tree parking is permitted to load/unload. Due to changes in Truro City Council's road works, it is advisable to get information before arriving. Choice of cereal, muesli, fruit and fibre, honey nut cornflakes, or porridge. Other cereals are available when making a reservation. Orange juice, yoghurt, banana, warm rolls with a selection of jams, marmalade and butter. Please do not hesitate to contact Ann at anytime, she likes to communicate with her guests.